Toronto – December 17, 2018 – Canada’s food workers’ union, the United Food and Commercial Workers (UFCW Canada), is calling on the federal government to stand up for the rights of migrant and temporary foreign workers by enacting urgent reforms to the Temporary Foreign Worker Program (TFWP), and the program’s primary agricultural stream in particular. Specifically, UFCW is asking the government to implement recommendations put forward by workers enrolled in the TFWP during the government’s Primary Agriculture Review of the TWFP, at which UFCW was a leading voice as Canada’s foremost advocate for agricultural workers. Between August and October 2018, UFCW Canada participated in meetings with TFWP participants and senior government officials in Leamington, Ontario; Abbotsford, British Columbia; and Saint-Rémi, Quebec. At the meetings, migrant agricultural workers shared their experiences working under the TFWP and offered suggestions for addressing problems with the program, including health and safety, housing, and harassment issues, among other concerns. Provide a transparent and impartial process for workers to appeal any decision to repatriate them to their home country. Immediately publish the statistics and criteria used by the government to determine the yearly wage rates for migrant farm workers enrolled in the TFWP. Enforce the provisions of the TFWP and the Seasonal Agricultural Workers Program (SAWP) to ensure that workers are paid at least as much as the provincial seasonal average wage rate. Create national standards for the provinces to accredit, monitor, and discipline domestic and offshore recruiters of foreign workers. Provinces that fail to meet these standards should be denied access to workers enrolled in the SAWP and TFWP. Inspect all workers’ housing prior to and following their occupancy. Frequent and random inspections should also be mandated and should occur regularly throughout the season. Employers who are found to be in noncompliance with standards for adequate housing should be terminated from the SAWP and TFWP. Conduct mandatory workplace health and safety training and ensure that written materials, such as instructions and signage, are provided to all migrant and temporary workers in their native language before they begin their employment. Prohibit employers found to be holding the personal documents of migrant workers, such as passports or health cards, from participating in the TFWP. Prevent employers that have engaged in unfair labour practices, such as blacklisting a worker, from participating in any other federal or provincial temporary foreign worker program. Ensure that workers are provided with a free medical exam before they return to their home country to confirm they are healthy and free from workplace illnesses or injuries. Sign the International Convention on the Protection of the Rights of All Migrant Workers and Members of Their Families, which has been adopted by the United Nations General Assembly. Replace closed work permits with sectoral permits that allow migrant workers to change employers within the agricultural sector across Canada. Provide migrant agricultural workers with a pathway to permanent residency in every province under the provincial nominee program. Extend full access to Canada’s Employment Insurance (EI) program to SAWP workers, who have consistently paid into the system since 1966, and remove access barriers to special benefits (first implemented in 2012). Reorganize SAWP so that recalled workers receive their visa directly from the Canadian government to prevent foreign government interference with domestic rights. 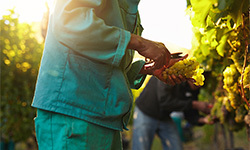 As Canada’s representative and advocate for food workers, UFCW Canada works closely with the Agriculture Workers Alliance (AWA) in operating a national, on-the-ground support network of volunteers and staff who offer information, training, and support services to migrant, temporary foreign, and seasonal agricultural workers across the country. To learn more about these efforts, click here.